Our last swap book feature is from Gretchen, of GHBooks. 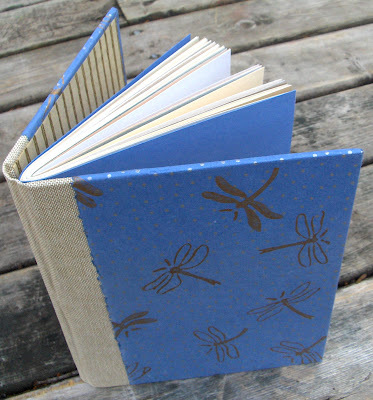 She made this pretty Dragonfly Journal for our swap using a hardcover pamphlet structure with a soft spine. Gretchen says it is the first time she has made this type of book. The pages inside are a nice mixture of papers that coordinate so nicely with the cover paper and fabric, in creams, muted browns and blues. Check our GHBooks.Etsy.com to see more of Gretchen's work. 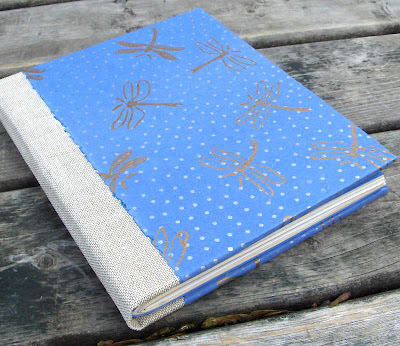 Love that dragonfly paper! Another beautiful book, as have been all the books in this swap. Well done, everyone! Lovely book Gretchen! I like the use of the pamphlet stitch with a hard cover. And lovely papers too! Another beauty! The papers and colors look just beautiful. It was much fun participating in this swap and so much fun seeing all the books presented here. Thank you, Rhonda, for all the effort and time you put in the coordination! Thank you, Gretchen. I just returned to town, and your book was waiting for me in my mail pile. Everybody, this is a very nicely done book.